Highland Omnibuses BA26 (EWS 115D) was a AEC Reliance with an Alexander Y-type body. It was new to Eastern Scottish, being transferred to Highland in mid-life. I have always thought that there is a fine line between coach and dual-purpose versions of the Y-type. 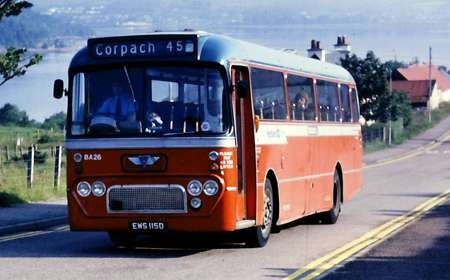 This example was classed as a coach by Eastern Scottish, but was definitely dual-purpose by the time this photo was taken. It is seen approaching Upper Achintore (with Loch Linnhe in the background) on a Fort William local service. Don, I’ve always understood that the way to tell the difference between a Y bus and a Y coach was the number of side widows. The bus had more, smaller, windows while the coach, as illustrated here, had fewer and bigger ones. . . . and as for the DP designation. I’ve always understood it was a bus body with coach seats, or fewer seats so as to make the longer journey more comfortable. Of course, going the other way, and downgrading a coach, you might cut down the seat backs, and put another row of seats in! I thought it was ‘coach’ seats but with ticket equipment fittings and power doors. Allowing the vehicle to be used on bus or coach services as required. Northern Scottish reseated some 53 bus seated Leopards to 49 dual purpose seats. The body had small windows! The SCT61 site does indeed have a good number of comments, as David says, and almost as many points of view. The PSV used to be classed as HACKNEY on the tax disc, then it was BUS – I’m sure Mr & Mrs Smith would have been horrified to read that on their extended tour coach they were actually going by bus! Some years ago, Southampton Citybus had a pair of what in a single decker might be regarded as DPs, but these were double deck buses, available for private hire. (Nigel Frampton may remember the E…HRV vehicles) On one occasion, I overheard comments about what a pity it was that, going along the M1, we couldn’t match the speed of "all these other coaches". Of course not, we were on a bus, then limited to 50mph while a coach was allowed 60. One morning, one of my travelling companions commented "Oh, good! A comfy bus this morning!" as one of these approached. Pete, there are no speed limit distinctions between ‘buses’ and ‘coaches’. Both were passenger service vehicles, now called passenger carrying vehicles. Buses intended for normal stop/start duties would have been geared accordingly, and this would have been reflected in the top speed. Some manufacturers, notably Dennis and Bristol, were early users of five speed gearboxes which gave their products a livelier performance on the road. Thank you for that nugget, Roger. I thought I had read somewhere that there WAS (even if there isn’t now) a distinction on speed limits. Perhaps it’s another example of the fugiting Mr Tempus! Speaking, buses and coaches were classified as PSV – public service vehicles, not passenger service vehicles. I know – I used to handle the PSV licensing in London. It was a strange description, more suited to dustbin lorries. I understand that a bus or coach under 12 metres long, capable of travelling at more than 60 mph and built before 1988 does not require to be fitted with a speed limiter and thus, if capable, can travel at more than 60 mph on a motorway. Pete – I certainly do remember the Southampton Olympian DPs. I think the E-HRVs stayed at Southampton for a full working life, and I believe that one (at least) still exists. There were a couple of earlier ones as well, but they were sold to Bullock of Cheadle after only a few years, along with 4 Dominator buses (the C-BBP registered vehicles). Although I contributed to that discussion on SCT’61 about the DP classification, I’m not sure I would recommend it to anyone as light reading! I think the point to remember is that the DP classification is a convenience for the benefit of enthusiasts, and dates from an era when documentation was virtually all on printed paper and photos were much less widely available. It was intended to distinguish vehicles which had physical features of both buses and coaches, rather than those which were purely buses or purely coaches. For example, bus shell bodies with coach seats, or coaches with bus seats. It has nothing to do with the actual use to which the vehicle is put; it needs to be capable of being determined based on simple observation; and it needs to be consistent for all vehicles regardless of operator. Operators tend to have their own codes, which suit their purposes, but differ, such that largely identical vehicles are classified differently by different operators. Of course, once you have a reasonably clear photograph of the vehicle (or you can see it in the metal), then the code becomes academic – you can see what shape of bodywork it has, and generally get a good idea of the type of seats. Given the almost infinite variety of combinations that have been built over the years, it is inevitable that there will be one or two anomalies when using a simple coding system of that nature, but that does not invalidate the code itself. Enthusiasts generally use the PSV Circle definition of DP, which is a bus shell with coach seats, or, very occasionally, a coach shell with bus seats. Operators often had their own definitions, which sometimes had more to do with what they wanted to do with the vehicle than its physical properties. It isn’t unusual to find a vehicle where the PSV Circle code is different from the operator’s. I’m surprised that Don says Eastern Scottish classed this vehicle as a coach, because it was new as ZB115, and in the SCT61 discussion it was stated that Z meant dual-purpose. X Toilet fitted coach.Used on vehicles that operated on the services between Edinburgh and London. Y non toilet fitted coach, often without any bulkhead behind the driver. Also not capable of being OPO operated. In many instances had the same type of seat fitted as those vehicles classed as a coach. In other SBG companies a 49 seat Y type with high backed seats would be classed as a coach. Yes, David, you’re right. Public Service Vehicles. A slip of the mind and fingers. I acted as advocate for LCBS in the Traffic Courts for more than ten years, so senility is clearly upon me. Thank you, gents, for your further thoughts on what is or is not a DP . 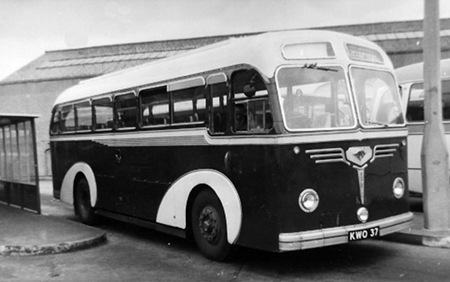 . .
Highland tended to put all the OPO-capable coaches it got second-hand (like this one) into the Poppy Red and Peacock Blue bus livery; even toilet-fitted Bristol RELHs. It might be correct that a coach earlier than a certain date, and with certain specification may not need to be fitted with a speed limiter but it is certainly not correct that it can travel at more than 60 mph. The legislation regarding speed limits and speed limiters is completely separate although the latter may have been introduced to facilitate the former. The 60mph rule was introduced before speed limiters became necessary.